James Tyler Fashion - if you like it wear it! James Tyler Fashion -Menswear - if you like it wear it! 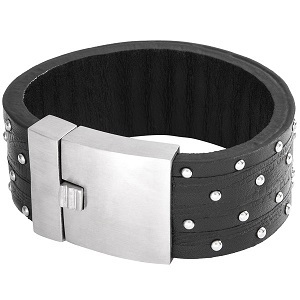 The bracelets by James Tyler are made for fashion conscious men. Men who know that an outfit is only completed when the right accessory is added. Men who have found their own personal style and are not afraid to express it, but are always open to trying something new. Sleek and understated or expressive and opulent: With us you are guaranteed to find the right bracelet to suit your style and character. Robust leather bracelets in various colours and designs, shiny stainless steel chains, with or without patterns, wide or slim: Add a final masculine touch to your look with a James Tyler bracelet. James Tyler offers a wide selection of men’s fashion. All whether parka, business shirts or vests – discover now the entire collection on our website. For many years, we successfully produce James Tyler clothing for the mens fashion areas that are sold exclusively through Amazon. This ultra-lightweight James Tyler down jacket is soft and light to touch and very handy. Its chambers are filled with a down feather blend which makes the jacket very cosy on cold days. The best thing: The jacket is warm without being bulky. The full front zip flows into a stylish standing collar. Two slit pockets on the sides are fitted with zips – there are also two additional slit pockets on the inside of the jacket. Finished with pure cotton, these timeless bermudas by James Tyler promise the highest level of wearing comfort. They have a casual chino style and thus feature a regular fit, French pockets, a piped coin pocket, buttoned flap pockets and darts at the back. This summery version of the beloved trousers has a casual character that is highlighted by a washed-out look.